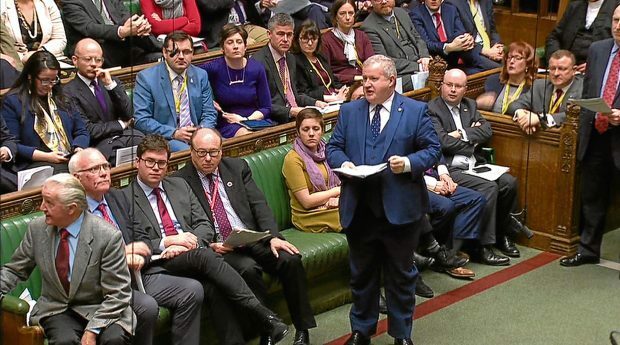 SNP Westminster leader Ian Blackford accused Theresa May of “grave cowardice” after she ducked demands to update MPs on her Brexit negotiations yesterday. The prime minister sent junior Brexit minister Robin Walker to the Commons to respond to demands from Labour leader Jeremy Corbyn for an update. Mr Walker was jeered as he explained he had been sent because negotiations were “at a critical stage”. As Mr Walker fielded questions, Mrs May was on the other side of Parliament Square at Westminster Abbey taking part in a Commonwealth Day service. Mr Corbyn told MPs that “the Government is in chaos and the country in crisis”. Mr Blackford added: “We are days away from the scheduled UK exit from the EU and yet this government still has no plan to protect jobs and living standards, the prime minister is guilty of neglect. He added: “We cannot ignore the facts, this place is in total chaos. The crisis engulfing the United Kingdom is deepening, in Scotland businesses, students, farmers, academics, mothers, fathers, EU nationals are rightly worried about their futures, but this government, this Tory party, this prime minister couldn’t care less about the people of Scotland.